The Tribest Sousvant combines the precision temperature control of immersion circulators with the ease of use of all-in-one water ovens. The all-in-one construction means that you will never have to struggle with any plastic wraps, ping-pong balls, or cutting holes in plastic. You get easy precision cooking with no DIY needed. The Sousvant�s lightweight removable carafe comes with built-in handles for easy filling and cleaning. The carafe�s clear sides and removable lid ensures that you do not lose water through evaporation while still being able to track cooking progress at a glance. Its extra-large 3 gallon capacity can hold enough water for your largest recipes while taking up surprisingly little space. 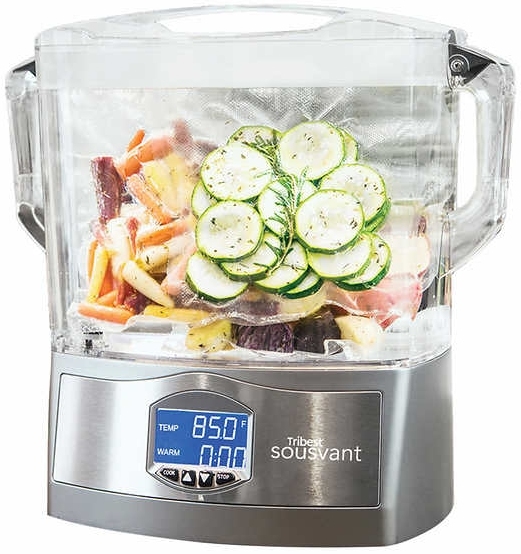 The Sousvant�s powerful 1000W circulation system rapidly heats water to your desired temperature and ensures that temperatures stay even all throughout the cooking carafe. The user-friendly digital controls make it ridiculously easy to set and hold temperatures to a tenth of a degree. The bottom-fed circulator allows you to use only the amount of water that you need. Just place your food into the carafe and cover it with water. There are no minimum or maximum fills lines to worry about. All you get is maximum precision control with minimum set up or effort. No set-up is required with additional containers, like immersion circulators. Removeable carafe makes it easy to fill and remove water in the 3 gallon capacity carafe. Transparent carafe lets you easily monitor the cooking process without opening the unit. Compact design allows for extra large 3 gallon capacity without taking up all the kitchen space due to the ingenious vertical design. Easy clip-on removeable lid prevents evaporation and helps regulate precise temperatures to .1 degrees. 1000 Watt built-in circulation system rapidly heats and maintains water to desired cooking temperature. 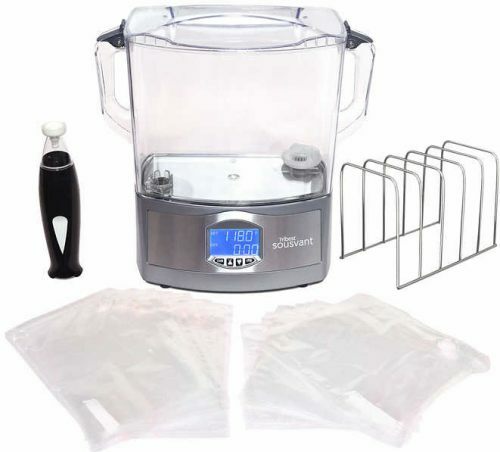 When you purchase your Tribest Sousvant Sous Vide from DiscountJuicers.com You will get a free vacuum pump and 20 Reusable Vaccum Seal Bags at no additional cost. This will allow you to get the maximum benefit from your Sousvant immediately without the need to purchase additional vacuum bags or vacuum sealer. DiscountJuicers.com is an Authorized Dealer for all Tribest products. Tribest products purchased from an authorized retailer includes FULL warranty protection (2 Years on the Sousvant). Purchases from a non-authorized retailer may NOT be eligible for warranty protection. Be sure to purchase from a known Authorized Retailer to ensure your warranty protection benefit.